We are the two Blood Clans. We have vampires on one side, and werewolves on the other. Which side will you pick? Right infront of the cave, which leads to the dens, is placed the Camp Clearing. Just as the dens, the clearing is well hidden from invadors and unwanted guests. It is surrounded by trees with wide green crowns, which barely let the sun rays light the place. In the middle there is a stump, which is used as stage by the leaders. When they want to announce something they get on it and speak. On few metres from the stump there is a stable of a falled tree, which is hollow inside. Usually the pups use it as a playground. The older wolves usually sit near the stump, mostly on places which are lit by the warm sunlight. Jake opened an eye, groaning as he felt the sun on his skin. He sat up, yawning as he stretched. His eye lids felt a little heavy from the nap he had taken. His joint were stiff as he stood up, peering around. He didn't spot any of the werewolves, so he didn't have anyone to fight. Sighing, he ran his fingers through his blonde hair. He thought about his options for the day. He sat for a moment, before a grin appeared on his face. "Let's pay a visit to the fangers." He said to himself. He set off at an even pace towards the edge of the werewolf territory, his claws already itching to fight. Jake came back to camp, Raizil following. He looked back at her, in love. He forgot he needed to tell her why there was no one here. "Just so you know, no body else lives here." He mumbled. Raizil followed him through the territory until they got to the clearing and she thought it was simply beautiful. "Wow, it's so pretty here. Oh well we will get more members I'm sure as loners pass through." She walked to him and hugged him, resting her he's in the crook of his neck. "Thanks Jake, it was you who gave me the courage to leave. And really all I ask in return is that you be yourself and treat me right and I will award you with the same thing." Jake blushed, before hugging her back. "You are right. And I will always treat you the best I can Raizil. Always." He whispered in her ear. He was tempted to try and kiss her, but it was too soon. He knew that, and simply hugged her gently. His cute, crooked smile appeared on his face, as he sighed with happiness. Raizil smiled against his neck. "Come on let's go to sleep, I'm really tired." She took Jakes hand and started to lead him to the dens, but she stopped and her face took on an evil grin as she heard Caspers voice in her head. Saying 'fine lets play'. She opened up her mind to him, "Casper darling I know you don't mean to start a dispute with the Alpha of Moonclan, now do you." You could almost hear the smirk in her voice. This wasn't how she had planned on telling him that she was now the leader of the werewolves but something's just didn't go according to plan. Raizil continued on the the dens. Jake smiled and followed Raizil. He stopped, squeezing her hand when he saw the evil grin upon her face. It worried him slightly. When she began walking again, he followed, a concerned look on his face. Indira would be lying if she said that she wasn't scared when she literally entered the wolf's den. She was utterly terrified and her bristling sandy-blonde tail showed it. Keeping her jaws clamped shut on the child's blanket, Indira racked through her memories on anything her aunt had told her on how werewolves summon each other. There were no other wolves in sight and she was not setting one paw in those dark caves. Not being able to remember how else to call to other werewolves, Indira decided to howl, in case it would work. Carefully setting the young boy inbetween her front paws and nestled in his soft blankets, Indira tilted her muzzle to the sky and let rip a beautiful melodious song that swept through the trees like a moon's whisper. She was hoping that her howl would make the Moonclan werewolves show themselves. Kenji was placed down on the ground. And he looked around the forest. There were so many different new things to him, and new colors. Upon hearing Indira's howl he tried to mimick it. Though it sounded as though he was half laughing and screaming at the same time. Raizil arrived at the clearing to see a sandy colored wolf, and in front of the wolf was what looked like a pup. She recongnized the she wolf from when they were on Crimson Fang's territory. "Hello there, would you mind shifting back so we can talk?" She asked nicely. She didnt want to scare the girl away, especially before she knew what was going on. 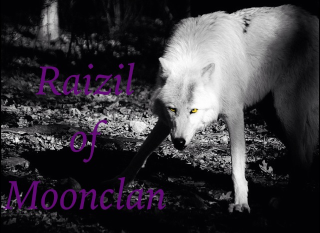 "My name is Raizil and i am now the Alpha of Moonclan. What your name?" she said smiling. Indira felt herself freeze when she spotted Raizil but judging by her tone of voice, the other werewolf did not wish to fight. Even if Indira didn't shift back, she definitely couldn't win in a fight against Raizil, though Indira could obviously run away but that would not be a nice feeling. Obeying the alpha's wishes, Indira shifted from a small sitting,sandy-brown wolf into a short girl with waist-long blonde hair, green eyes and an unexplainable scar across her right eyebrow. Indira was still sitting in front of the cub, keeping him from falling over by holding him upright. "M-my name's Indira. I am the owner of the apothecary in the village." She responded in a clear voice. Indira could feel the more aggressive, wolven side of herself pacing about and snarling, even if the human side was so tense from nerves that it felt as if her bones were going to melt. Jake walked up behind Raizil, his eyes shifting between her and Indira. He light green gaze watched the girl carefully. "This loner was at our first fight." He whispered, recognizing the scent. But another hit his nose, a milky one. He sucked in a breath, as his eyes laid on the child. His heart melted, as he could see his little brother in the baby. He instantly wanted the child, and looked back to Indira. "Is that boy... Yours?" He asked, obvious want in his voice. "What?! No!" Indira answered, her cheeks turning a light pink at the thought of the cub being her own. It would of been impossible anyway. "I found this cub hidden between two rocks. The mother's scent was stale so I brought him here. I though that you wolves could raise him because I cannot." Indira spoke rapidly to hurriedly explain to the other wolves how she came across this child. It would be better for the cub if he were raised with them and the forest rather than being brought by Indira around humans. However the want in the male werewolf's eyes unnerved her and old tales of what wild canines occasionally did to young defenceless phosphate was brought to her mind. The other female werewolf seemed trustworthy but Indira was still edgy around the male. Raizil didnt say anything and just watched the interaction between Jake and Indira. She could see the want in Jake's eyes and a bit of pride came about her. To know that he wanted to raise a child that wasnt even his, meant that he was responsible. "Well Indira, I do not mind taking the child in and raising it. Plus seeing how my mate here seems to really want the child I think it will be in good hands here. It was smart of you to bring the child here. And although you are a Loner you are also a healer and I give you permission to come and go unto our lands as you please. Or you could just join us and work at the apothecary. Our kind isn't really meant to be alone, you know." Raizil suggested. They needed more members and she didn't feel right leaving a she wolf like her out on her own. Raizil's offer shocked Indira. She was happy, of course, that she had agreed to look after the boy but the request of her joining the wolf pack was too much. In a way, it brought back tender memories that were best left alone, preferably in a locked chest with no key so that nobody could obtain the secrets within. Murderers should be isolated. Indira herself was a murderer though many would say that it was justifiable to kill someone who had slaughtered your only kin. However Indira had killed the werewolf Bran in cold blood and even if he had destroyed her family, nothing could excuse her from enjoying the kill she had made that night. "Thanks for the offer, but it is best if creatures like me are seperated from others. If anyone in your clan falls sick, just tell me and I will come as soon as possible." Indira stated. Quietly, she then gently picked up the small boy and held him out for Raizil to hold him. Raizil took the boy from her hands. And shifting him she held him securely with one arm. She used her other to grab hold of Indira. "Thats a horrible thing to say about yourself. But I will respect your wishes. But I do want you to know that sometimes only ridding the world of that evil is the only means of justification." She looked at Indira with understanding in her eyes. She saw the same guilt in her eyes as Rai saw in hers. "I know that better than you think. Dont regret your decision Indira, for I can tell you I have never regretted mine. You just have to come to accept it." Raizil had killed many in cold blood all for the sake of money. Her life as an assassin was one she chose and had learned to finally be alright with that part of her that could just murder somebody just to do it without any real reason. Indira blinked slowly, she could feel her other side seemingly laugh sarcastically inside her head. Instead of keeping that instinctive part of herself bottled up, Indira decided to drag some of it's words and weave it around her own. "I have come to accept it. There is something dark that lingers inside of me and nothing could justify it. It enjoys to murder, terrorize and maim but by keeping myself alone, it has no excuse to carry out it's wishes. I am not lonely, the people I heal are friendly and talk to me often. However I do not share your views in ridding the world of evil. Without evil, there is no good just like there is no day without night nor death without life. If we were to rid the world of the evil then we would not see the good, and I would have to try and rip myself in half but that impossible because I would not exist without it. I respect your views and I thank you for your help, I am sure you will raise the child well, but I will not regret my decision to be alone. My heaping services will always be open to you and your pack." Indira eyes had changed during her speech to that of someone cold, almost malevolent, and without emotion as if they would enjoy it if they could watch the world burn and the innocents slaughtered. But now that that side of herself had been shoved back into it's cage, Indira's eyes softened into the gentle grass-green they had been. "Sorry." She murmured, so low that only one of her own kind could pick it up. Jake carefully watched the interaction between the two females. He was happy when the child was to be raised by him and Rai, an obvious smile on his face. If he had been a cat, he would have purred. He was about to speak when the two began speaking about their pasts. He was shocked when they seemed to have done similar things, both seemed to regret their actions. The male shuffled a little closer to his mate, happiness sparking in him again when Raizil said the word. He used a gentle hand to push the hair of the boy back. Confusion furrowed on his forehead. "What's his name?" He called after the loner, concern in his pretty light green gaze. Indira turned her gaze over to the male, who had finally spoke after lurking behind his alpha. "I am not sure. I could not find a note of any sort with him." Indira stated honestly, frowning slightly at the thought of a mother who would not only abandon a child, but not give it a name. Well, the boy probably had a name but without a note or the mother it would be almost impossible to figure it out. "Maybe you should give the child a name" She suggested. It would most likely be better for the child to grow up with a given name than to grow up without ever knowing what your name was, like a bad case of anemia. Indira had seen such cases before and the effects on the victims were traumatic, not knowing who you were if who you should be can severely damage and dent any mind, even a supernaturals. Jake nodded. It made perfect sense to him. "Thank you for bringing him to us." He said with honest gratitude. He rested an arm on Raizils shoulder, gazing back at the child. Instantly, a single name appeared on his tongue. "Kenji." He said. He wished he could take it back, it was the name of his little brother. He looked at Raizil for a reaction. Paramore was scooping things out from a tree branch and sighed "I need something to do" she said. She jumped down and went into the shade of her tree. She shifted into her blood red wolf. Its color matched her hair, so she loved it. She loved any color red, especially when she was fighting the leeches. That's what she called the vampires. She despised them and blamed them for her parents death, even though it was just fire. Raizil saw the change in Indira, "Are views certainly are different, and I respect you for who you have come to be. Like I said you are welcomed here, whenever. I would like to maybe get to know more about you, to hang out sometimes. Go in peace, and safe travels Indira." She let go of her arm and cradled the child in both her arms. When Jake asked about the name of the child she waited to her the answer but there was none. She looked at Jake at the name he chose in surprise then her gazed softened. "That's a perfect name, Jake." She looked at him with love, "hopefully he won't have your impulsive behavior to attack just anybody." She said teasing him. Jake smiled softly, chuckling ay her joke. "Hey, it's how I met you, right?" He chuckled. He shifted his weight again, feeling slightly uncomfortable. "Kenji..." He whispered again. "Where will his crib be?" He asked. That was kinda important. Raizil laughed and shook her head. "How about for now we just put it in our room." she said placing an emphasis on our. She was accepting Jake as her mate. Rai wasnt really good with always talking about her feelings but she was good at showing them. "Come on lets get Kenji back to the dens so he can sleep. Im sure he is hungry. So how about you take him back and I will go into town and buy some baby supplies. He doesnt look like a newborn so he could be about 3 years old." Jake smiled at the female, love in his gaze. He took his arm off her shoulders, moving his hand instead to her cheek. He couldn't help but show his love. "Ok. You would better at shopping for that kind of thing." He chuckled, reaching out to take Kenji. Paramore shifted back and walked over "A kid?" she asked. She didn't know any mates where here. She thought in her head 'when will I get a mate' but then shook her head 'there Is none for me' she told herself. While she was thinking her green eyes glazed over. She did this a lot, daydreaming. She hated when she did it but it was a calming thing.